On November 10, 1958, Soviet Premier Nikita Khrushchev delivered a speech in which he demanded that the Western powers of the United States, Great Britain and France pull their forces out of West Berlin within six months. This ultimatum sparked a three year crisis over the future of the city of Berlin that culminated in 1961 with the building of the Berlin Wall. The division of Germany and its capital city of Berlin among the four victors of the Second World War was frozen in time by the onset of the Cold War despite the postwar agreements to unify the zones. West Berlin remained under western control, but it was located deep inside East German territory, and that made its protection from communist takeover a constant challenge for the western powers. In 1948, the Soviet Union sparked a crisis in the city by cutting off land access between West Germany and West Berlin, necessitating a year-long airlift of supplies to the stranded citizens before the Soviets reopened the passageways. By 1958, however, a similar situation would have doomed the city; it was already too populous and too prosperous to be supplied via air. The United States heralded the economic success and political freedom of West Berlin as a symbol of the success of the capitalist system, and it was deeply committed to its security, so a Soviet decision to cut off land access again had the potential to lead to a more serious conflict between the two powers. At the same time, the existence of West Berlin was increasingly becoming a liability for the Soviet Union and the East German government. The divided city highlighted the sharp contrast between the communist and capitalist systems, and the freedom of movement between the sectors had resulted in a mass exodus from the eastern side. Looking for a way to stop the flow of people from east to west and a means to check the growing military power of West Germany, Khrushchev insisted in his November 1958 speech that it was time for the United States to pull out of the city. The west interpreted his speech as an ultimatum, and U.S. President Dwight Eisenhower became determined not to give in to Soviet demands. Instead, the two sides opened a foreign minister’s conference at Geneva in the summer of 1959 and made an attempt to negotiate a new agreement on Berlin. Khrushchev wanted the Western garrisons out of West Berlin as a precursor to reunifying the city, but Eisenhower believed that protecting the freedom of West Berlin required an ongoing U.S. presence. Although Khrushchev and Eisenhower made some progress toward mutual understanding during talks at Camp David in the United States in 1959, relations became tense after the Soviet Union shot down an American U-2 spy plane canvassing Soviet territory in 1960. In the wake of this incident, there appeared to be little hope for accommodation. At that point, talks ceased, and the Soviet premier appeared willing to wait for the U.S. presidential elections to take place so he could begin anew with the incoming administration. However, the first negotiations between the new U.S. President and Khrushchev did not result in a resolution. In the summer of 1961, President John F. Kennedy met with Khrushchev in Vienna to address the ongoing issue of Berlin, in addition to the countries’ competing interests in Laos, and the question of disarmament. Although they agreed to further discussions on Laos, they found no solution to the Berlin problem. In the wake of the conference, Khrushchev once again gave the United States six months to withdraw from Berlin. 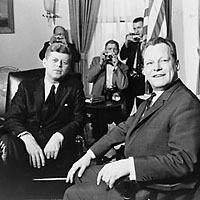 Kennedy responded by activating 150,000 reservists and increasing defense expenditures, in preparation for a potential conflict over the future of the city. Unwilling to face a potential nuclear escalation over the city, Khrushchev prepared to take his own form of action. On the morning of August 13, 1961, Berliners awoke to discover that on the orders of East German leader Walter Ulbricht , a barbed wire fence had gone up overnight separating West and East Berlin and preventing movement between the two sides. The barbed wire fence was soon expanded to include cement walls and guard towers. The Berlin Wall would prevent the West from having further influence on the East, stop the flow of migrants out of the communist sector, and ultimately become the most iconic image of the Cold War in Europe. The United States quickly condemned the wall, which divided families and limited freedom of movement. Shortly after the wall was erected, a standoff between U.S. and Soviet troops on either side of the diplomatic checkpoint led to one of the tensest moments of the Cold War in Europe. A dispute over whether East German or Soviet guards were authorized to patrol the checkpoints and examine the travel documents of U.S. diplomats passing through led the United States to station tanks on its side of the checkpoint, pointing toward the East German troops just beyond the wall. Concerns that U.S. forces would either attempt to take down the wall or force their way through the checkpoint led the Soviet Union to station its own tanks on the East German side. A wrong move during the face-off could have led to war, and any conventional skirmish between two nuclear powers always brought with it the risk of escalation. Instead, Kennedy made use of back channels to suggest that Khrushchev remove his tanks, promising that if the Soviet Union did so, the U.S. Army would reciprocate. The standoff ended peacefully. The Berlin Wall remained in place until November 9, 1989, when the border between East and West Berlin was reopened and the wall itself was finally dismantled.